In São Paulo, as in the entire country, the circulation of vehicles occurs on the right side of the way. If you have arrived to the city by car or has decided to rent one, stay alert for the license plate restriction and park only at appropriated places. It applies to cars and trucks, the Rush Hour Operation (Rodízio) consists in a rotating system according to the license plate’s final number and the day of the week in which vehicles may not circulate in streets and avenues from 7am to 10am and then again from 5pm to 8pm. There is no restriction on Saturdays, Sundays and holidays. If you have any questions, please contact the CET Operations Center at 1188. Understand how the Rush Hour Operation works and follow the traffic on the Companhia de Engenharia de Tráfego. 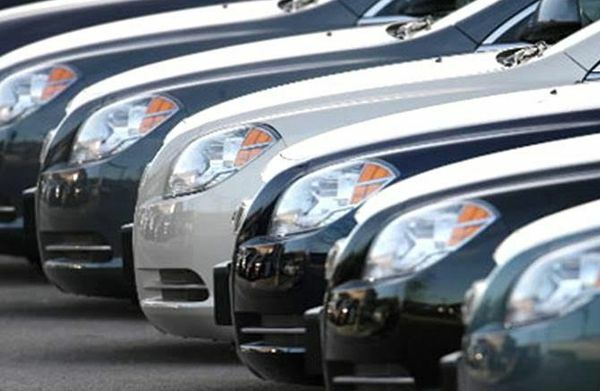 The city of São Paulo is well served by the major car rental companies of the world. Learn more with its representatives in your city. More information can be obtained at the Associação Brasileira de Locação de Automóveis website: www.abla.com.br. Give preference to public transportation. In case this is not possible, make an option for less polluting fuel resources. When parking vehicles in the street pay attention to the parking signs and restrictions. There are locations where it is allowed to park only by buying a Azul Digital Card -CAD, which can be obtained through specific smartphone and tablet applications. You can purchase it without the app at points of sale such as newsstands, bars, snack bars, drugstores, markets and bakeries, look for the blue zone symbol. The period of use is limited to 1 or 2 hours and the price of the individual card is R$ 5,00. Elderly people, wheel chair users and all the other people with restricted mobility have exclusive parking spaces in shopping places and public places; as long as the vehicle is properly labeled. Foreigners that wish to drive in São Paulo may drive up to 180 days after the date of arrival in the country. In order to do so, the driver must be licensed in one of the countries that have signed the Vienna Convention or that have reciprocity with Brazil. It is required to have in hands its driver’s license from the country of origin (respecting its expiration date), and also an ID card. The use of mobile phones while driving is prohibited and it will be fined. The driver that is caught driving after drinking alcoholic beverages may lose its license, pay a fee and get arrested. You can meet several touristic attractions of the city in a fast and efficient way, taking the Subway. The subway lines operate daily from 4:40am and at different times of closing in each station. For those who wish to transfer, the limit time is at midnight. The five lines are 1-Azul, connecting North and South from Tucuruvi to Jabaquara; 2-Verde, which goes across Avenida Paulista connecting Vila Madalena to Vila Prudente; 3-Vermelha, going from East to West connecting Corinthians-Itaquera to Palmeiras-Barra Funda, 4-Amarela, which goes from Luz to Butantã, and 5-Lilás, from Capão Redondo to Brooklin. The bilhete unitário fee, one trip only, costs R$ 3,80. It also makes the transfer between subway lines and buses. Information on the websites – Subway www.metro.sp.gov.br – tel. : 0800 770 77 22, Via Quatro – www.viaquatro.com.br – tel. : 0800 770 71 00 or SPTrans – www.sptrans.com.br – tel. : 0800 771 01 18. Bilhete Lazer – BLA: travel with a discount on the Subway and CPTM Trains from 6pm on Saturdays until the end of operation on Sundays. The BLA can be acquired for R$ 2,00 and it can be recharged at the Bilhete Único stations. Be aware: the BLA is not accepted on buses. Several stations in our railway system have elevators, escalators, tactile pavement and sound warnings. Physically disabled people, people carrying babies, overweight people, pregnant women and mobility restricted people for any reason can use the spaces reserved for wheel chairs and/or reserved seats not having to stand in lines. The access to visually disabled people with guide dogs is allowed in every station. The Companhia Paulista de Trens Metropolitanos (CPTM) has six complementary lines to the Subway system connecting the capital paulista with around 30 cities of the metropolitan region, such as Jundiaí, Mogi das Cruzes and Itapevi. There are over 100 stations operating daily, starting at 4am, in all four corners of the city. The bilhete unitário costs R$ 3,80 and the transfers between train and subway are free of charge. The six lines are 7-Rubi, connecting Jundiaí to Luz; 8-Diamante, leaving Amador Bueno and going to Júlio Prestes; 9-Esmeralda, parallel to Marginal Pinheiros connecting Grajaú to Osasco; 10-Turquesa, from Rio Grande da Serra to Bresser-Mooca; 11-Coral, on the West Side, from Estudantes, going through Poá, to Luz, and lastly 12-Safira, from Calmon Viana to Brás. Touristic Express: CPTM makes available on weekends train rides from Luz Station to three tourism destinations of the metropolitan region: Jundiaí, Mogi das Cruzes and Paranapiacaba. To see more details about the touristic express, access here. 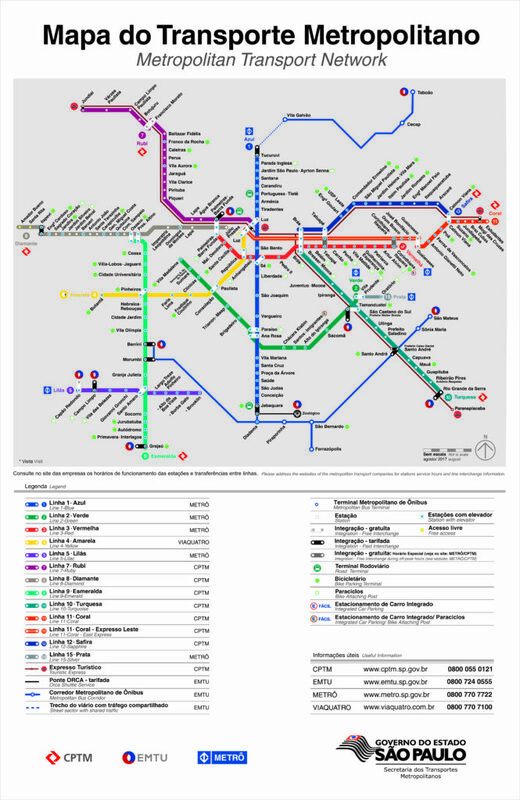 More information about the Companhia Paulista de Trens Metropolitanos on tel. : 0800 055 0121 or at the website www.cptm.sp.gov.br. Just like the subway, the CPTM system also provides comfort and safety to disabled people and people with restricted mobility by having stations and trains which are accessible, adapted equipment, several kinds of signs and reserved seats. 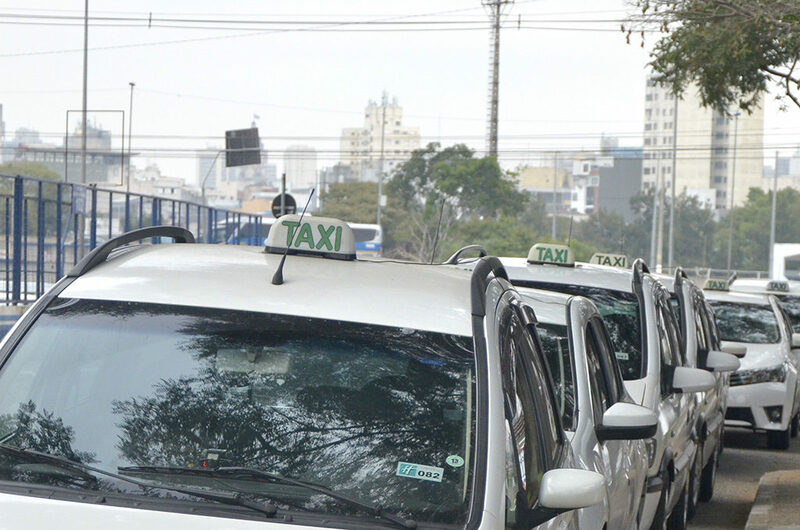 It is easy to find taxis in São Paulo: there are over 34 thousand vehicles registered. Common taxis in São Paulo are identified by the color white and red license plate. Foto: José Cordeiro/ SPTurisThe price to be paid is determined by a taximeter, located on the car´s dashboard. There are three categories: common, special and deluxe; taking into consideration that the last two provide a better and special service, being more expensive. Fare 1 (Monday to Saturday from 6am to 8pm) R$ 2,75 per kilometer. Fare 2 (Monday to Saturday from 8pm to 6am, Sunday and holidays) R$ 3,58 per kilometer. São Paulo has roughly 1 taxi for every 300 inhabitants. Our fleet is almost three times bigger than the one in New York! 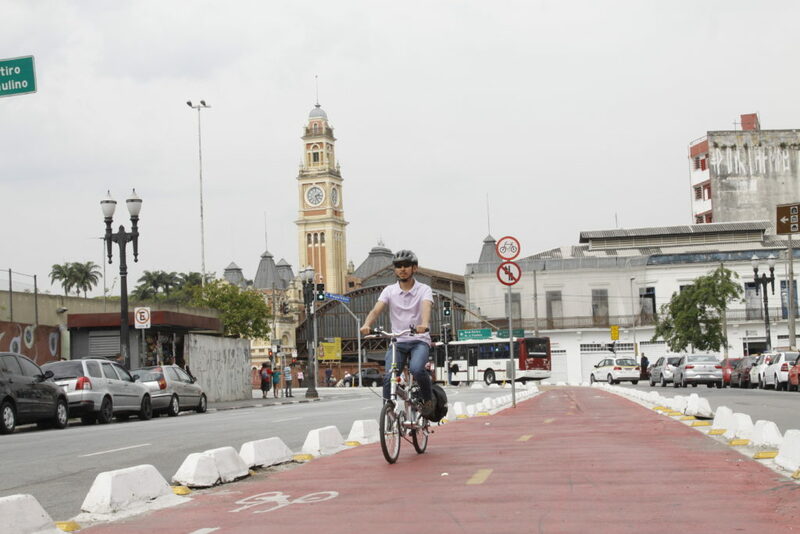 Riding a bike in São Paulo is each time more pleasant and safe with the implementation of the new cycling structure. Bicycles are an excellent option for those who wish to know the city and explore its touristic attractions. If you haven’t brought your bike, don’t worry. There are several places in the city where it is possible to rent one. Besides this, there is an increasing in the bike friendly program; they are equipped to welcome those who come by bike. To ride a bike doesn’t pollute the environment, burns calories and gets you away from traffic! In the last few years, the city gained more than 400 kilometers of proper ways for the circulation of bicycles; including cycling ways, lanes and routes. There is still the leisure cycling lane: a temporary lane that operates on Sundays and national holidays, from 7am to 4pm, with vertical and horizontal sign orientation with cones and other elements. At the subway and at CPTM, bikes are allowed on the last car: from Monday to Friday, starting at 8:30pm; Saturdays after 2pm; Sunday and holidays all day long. The metropolitan bus terminals from EMTU also offer spaces for bikes. Do not forget to bring with you some indispensible items to ride a bike, such as water, cereal bars or fruits, sunscreen, sports cap and a raincoat. Check out much more at SP de Bike. 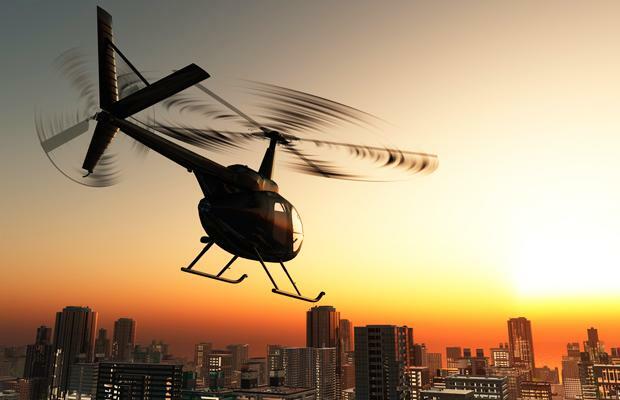 São Paulo is the city that has the largest helicopter fleet of the world. It is one of the fastest ways to move around quickly and effectively. There are air taxi companies that offer, in fact, touristic tours so that you can get to know our attractions from incredible angles. The rides take an average of 30 minutes to 1 hour and the prices vary according to the service hired. Besides this, São Paulo also has an heliport, Helicidade, located on the West Side of the city, which offers comfort and services for its passengers. Learn more on www.helicidade.com.br. The public transportation offer in São Paulo is very wide. The city has the largest railway line and subway line of the country; besides a bus fleet with over 15 thousand buses that have exclusive lanes and corridors for the rush hours. The passenger boards on the front and gets down on the rear. On the bus corridors, boarding and exiting are on the driver’s side. São Paulo’s bus fare is R$ 3,80. More info: www.sptrans.com.br. Information regarding operational times and bus routes can be found at the telephone 156 – call free of charge. Check also Apps suggestions for tablet and mobile phone. 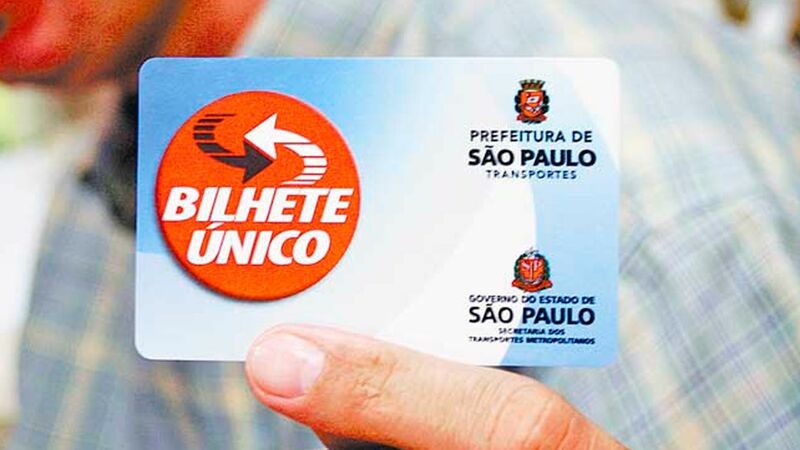 On SPTrans Stations, bus terminals, Subway Stations and other licensed locations, the visitor can buy the Bilhete Único, a magnetic card that can be filled with credit. There are two ways of inserting credit on your card: regular money fare or time fare (unlimited rides within a specific period – daily, weekly or monthly). Whoever does not hold a Bilhete Único can pay the fare straightly to the collector; however, for those who do, they will pay less if they wish to have a bus-train integration. There are intercity buses with variable fares. Consult www.emtu.sp.gov.br. Physically disabled people and passengers with restricted mobility (elderly people, pregnant women and overweight people) will find vehicles with low platforms on the major bus corridors and exclusive lanes. The buses have no internal obstacles and they have reserved areas with safety devices for wheel chairs; besides reserved seats. Information about special buses services to Guarulhos Airport, the Airport Bus Service, can be provided by the telephone 0800 724 0555 or through the website: www.airportbusservice.com.br. Para o que der e vier.